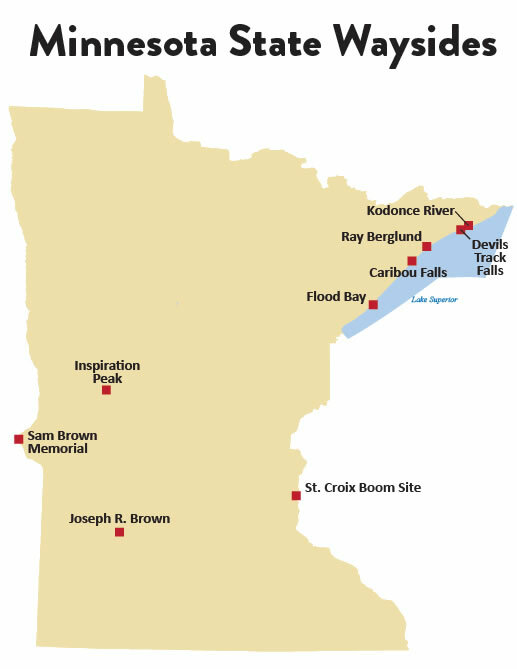 The Minnesota state park and trail system includes nine waysides, most of them along Minnesota State Highway 61 on the North Shore. These are generally parcels of land too small to be full-fledged state parks, but with more cultural or natural resources than those found at highway waysides and rest areas. Some Minnesota state waysides are minimalist, with not much more than a parking area and a short trail. Others have sanitation facilities, picnic tables and historic buildings. Hiking: There is a 3/4 mile trail within the wayside. 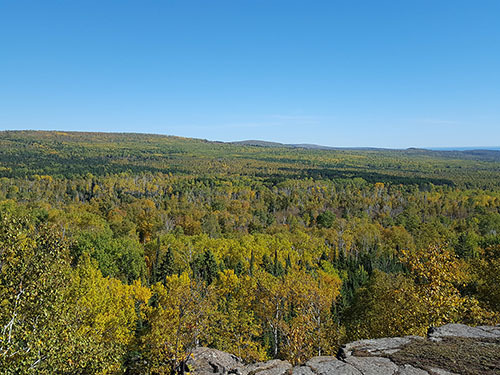 A great hike along the Caribou River leads to the base of Caribou Falls (35 foot waterfall), and also provides stunning views of Lake Superior and the Caribou River gorge. 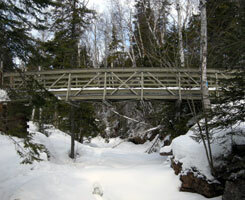 The wayside offers access to the Superior Hiking Trail. Fishing: Caribou River is a designated trout stream. Sanitation facilities: One vault toilet. Hiking: Access to Devils Track is off the Gunflint Trail via the Superior Hiking Trail. Sanitation facilities: There are no sanitation facilities at this wayside. Additional information: It is a two-mile hike, one way, to reach the wayside. 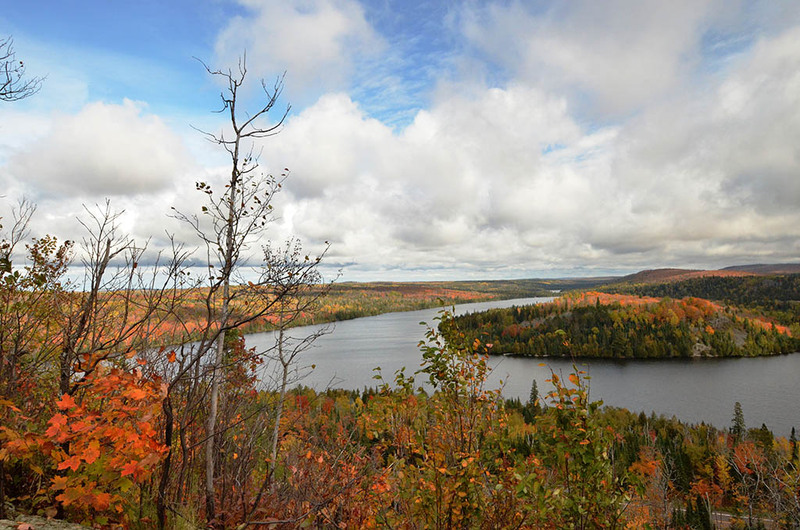 From here you can visit Pincushion Mountain, a rock outcrop overlooking Lake Superior. Hiking: This area has one of the top beach walks along the North Shore. 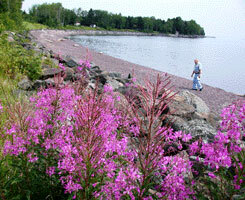 A long pebble beach leads visitors along the shores of Lake Superior, just outside the city of Two Harbors. Additional information: Flood Bay has a beautiful wetland area that has quite a bit of beaver activity and waterfowl. Visitors get a chance to see ducks, geese, beaver, and in the spring - otters! Hiking: A winding trail to the summit passes through a beautiful hardwood forest that opens to an expanse of rolling prairie hills. Additional information: Rising 400 feet above the surrounding countryside, Inspiration Peak offers spectacular views in three directions. 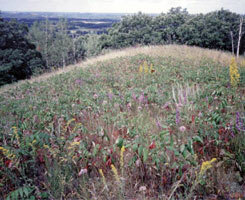 The native prairie on the top of the peak has been there for hundreds of years, and showcases many beautiful prairie wildflowers. Nobel Prize-winning novelist Sinclair Lewis shared his passion for this peak with his readers. Learn more. Picnic area: One picnic table. Fishing: There are no public fishing areas within walking distance of the wayside, but around the valley there are many access points to the Minnesota River. 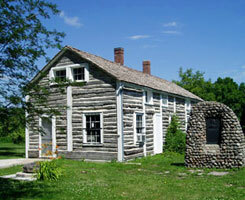 Additional information: 2012 marked 150 years since the U.S.-Dakota War of 1862. 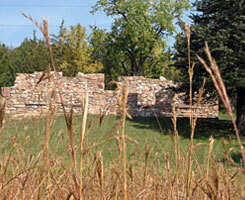 This wayside features the ruins of Joseph R. Brown's three-story mansion, destroyed during the Dakota War of 1862. Who was Joseph R. Brown and why is his house so significant? Find out why here. 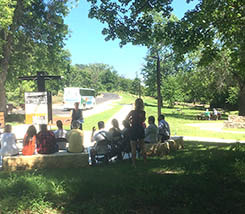 Picnic area: There are picnic tables within the rest area off U.S. Highway 61. Hiking: Access the Kodonce River Gorge via a Superior Hiking Trail spur. 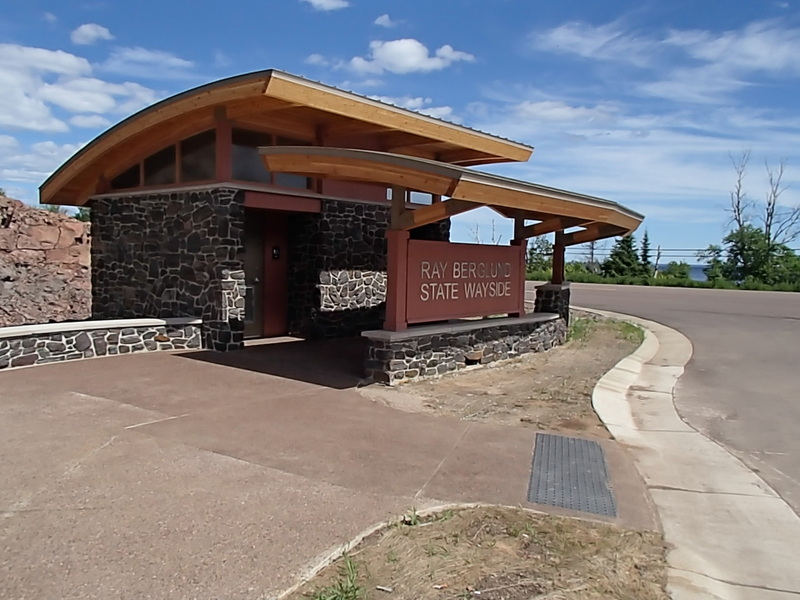 Additional information: Off from the rest area, enjoy a walk down to Lake Superior beachfront along the mouth of the Kodonce River. Picnic area: Picnic tables located on a nearby bluff within 100 yards, with a view of Lake Superior. Hiking: A 1/2 mile, primitive trail along the bluffs overlooks the Onion River. Fishing: The Onion River is a designated trout stream. Sanitation facilities: There are seasonal sanitation facilities. Additional information: This wayside is a memorial to a St. Paul businessman and conservationist, on land donated by his friends and family. Located near the mouth of the Onion River, the site provides a good view of Lake Superior from across U.S. Highway 61 and the Gitchi Gami State Trail. Hiking: A half-mile trail along the St. Croix River connects historical and geological markers with the north parking lot, where there are interpretive panels, a large picnic area and a seasonal sanitation facility. Fishing: Yes, there is shoreline fishing along the St. Croix River. Note: Access requires walking down a large staircase to the beach area. Additional information: Located about 2.5 miles north of Stillwater on State Hwy. 95, the 26-acre Boom Site overlooks a wide area on the St. Croix River where an estimated 15.5 billion feet of logs from the pine forests of the St. Croix valley were gathered and sorted before being floated downstream to sawmills between 1856 and 1914. The Great Depression-era Works Progress Administration developed the site as a roadside recreational area in the 1930s, and it was designated a National Historic Landmark in 1966. 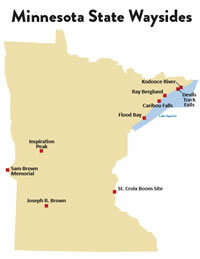 More information about the Wild & Scenic Lower St. Croix River. Additional information: 2012 marked 150 years since the U.S.-Dakota War of 1862. Created to honor Joseph R. Brown's son Samuel J. Brown, the "Paul Revere of the West," who rode 120 miles through a storm on April 19, 1866 to warn of an expected Dakota attack. In the summer, this wayside features a cabin run by the Browns Valley Historical Society - open Friday, Saturday, and Sundays from 1 p.m. to 6 p.m. Times may vary, please check with the museum before visiting: 320-695-2316 (evenings and weekdays only).